Tinkle Time Trainers by Rainshine Designs feature waterproof PUL outers, bamboo/Zorb soakers and gentle fold over elastic leg and waistbands for wick free protection. Designed to have enough absorbency to catch a single accident they look and feel like real underwear to make your child feel like a "big kid". You choose your size and favorite PUL outer and I'll choose co-ordinating side panels, cotton or bamboo velour inner and fold-over elastic. There's also the option to upgrade your trainer to a night-worthy version. 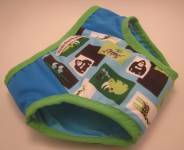 We change out the cotton velour inner for extra thirsty bamboo fleece and add a snap-in soaker of bamboo fleece topped with cotton or bamboo velour.